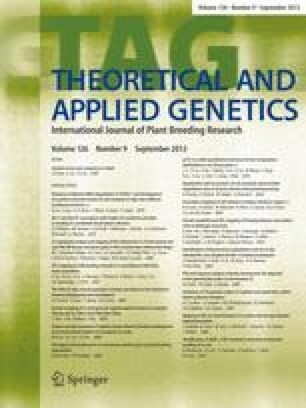 RFLPs, AFLPs, RAPDs and SSRs were used to determine the genetic relationships among 18 cultivated barley accessions and the results compared to pedigree relationships where these were available. All of the approaches were able to uniquely fingerprint each of the accessions. The four assays differed in the amount of polymorphism detected. For example, all 13 SSR primers were polymorphic, with an average of 5.7 alleles per primer set, while nearly 54% of the fragments generated using AFLPs were monomorphic. The highest diversity index was observed for AFLPs (0.937) and the lowest for RFLP (0.322). Principal co-ordinate analysis (PCoA) clearly separated the spring types from the winter types using RFLP and AFLP data with the two-row winter types forming an intermediate group. Only a small group of spring types clustered together using SSR data with the two-row and six-row winter varieties more widely dispersed. Direct comparisons between genetic similarity (GS) estimates revealed by each of the assays were measured by a number of approaches. Spearman rank correlation ranked over 70% of the pairwise comparisons between AFLPs and RFLPs in the same order. SSRs had the lowest values when compared to the other three assays. These results are discussed in terms of the choice of appropriate technology for different aspects of germplasm evaluation.